in Arizona Highway magazines during the 1960s. before she retired and still dabbles in art to this day. If you google "Jerimiah Theus", you will read about one of Valerie's ancestors. Jerimiah was an early American Artist for over 30 years in Georgia, during the 1700s. As you can see, Ms. Toliver's talent comes to her naturally! 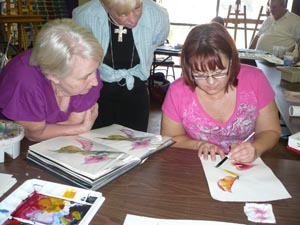 Valerie is a purist - only devoting her artistic efforts in watercolor painting. of mood with an exotic command of color. But her true love is teaching. If your painting looks flat, she shows you how to give it depth. - including architectural, mechanical and electronic design. the world of fine art by creating paintings that are unusually dramatic for watercolor. Valerie has been teaching around the valley since 2004.
and at her studio in Central Phoenix. in which 1273 seats were filled with students that found her instruction to be quite helpful and motivating. and hopefully, a watercolor instruction book! Desert Mountain Art League and Jerry's Artarama. Her work was displayed at Banner Good Samaritan from February 24, 2012 to April 27, 2012. In September, 2010, Valerie was a guest artist at the "Artists of the Rim" Gallery in Payson, Arizona. Her work was also displayed at West Valley National Bank in September 2009.
and has won an award at the State Fair every year since then. At Scottsdale Artists League (SAL), she placed "Artist of the Month" in May 2003 and September 2004. The Art League West (ALW) awarded her "Artist of the Month" four times from 2008 to 2009. "Crisp Morning Air" on the front cover in 2005. PCC also displayed over 40 pieces of her work during November 2005 in their Fine Art Gallery. that help students remember watercolor procedures!